I have been building web solutions since 2000. After many years as a web designer I decided to focus on application development. In 2009 I moved to Istanbul, the centre of business life in Turkey to continue my professional career surrounded by the best Turkey has to offer. 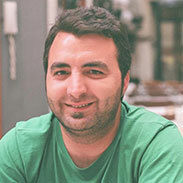 In Istanbul I have developed considerable knowledge in client side & interface technologies. At first I was freelancing but have since been working within various corporations which have helped me better understand client & user needs both here in Turkey and internationally. This has led me to specialise in e-commerce solutions. I have been the Business Development Manager at Aktif Bank since July 2013. I deal with the business development of web/mobile technology solutions that I have managed from the ground up. My previous experience in all roles means I can see the bigger picture and develop solutions that benefit both users and clients alike. Responsible for Digital Banking, Personal Internet Banking, Corporate Banking, Dealer Portal and Online Credit Application. Analysis of technical specification-based, managing outsourced projects, working closely with Businness Units. Responsible for front end developed web sites considering compatibility with web standards and browsers. Responsible for front end design for developed e-commerce web sites considering compatibility with web standards and browsers. Developing web solutions including programming, design and implementing latest web technologies for Coşkunöz Holding and its companies.